NDA Eligibility Criteria 2019 must be check by the candidates before applying. The candidates want to join National Defence Academy (NDA) have to appear in the entrance examination conducted by the Union Public Service Commission (UPSC), New Delhi. The authority schedules the examination two times within a year in the month of April and September. All the aspirants are suggested to check the prescribed eligibility mentioned here. In this article, we have provided the detailed information about NDA 2019 Eligibility Criteria. NDA 2019 is conducted for the All India candidates whose desire is to join Indian Defence forces. 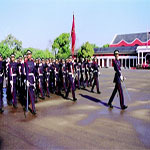 Through NDA, the candidates are recruited in Air Force, Navy, and Army. The interested candidates can fill NDA 2019 application form from 9th January 2019 (for NDA I) and from 7th August 2019 (for NDA II). The appearing candidate must be a citizen of India, Nepal or Bhutan. A person of Indian origin who has migrated from Burma, SriLanka, Pakistan & East African Countries of Kenya, Uganda, the United Republic of Tanzania, Zambia, Malawi, Zaire, and Ethiopia or Vietnam with the intention of permanently settling in India are also eligible to apply. Candidates other than the citizen of India and Gorkha subjects of Nepal have required a certificate of eligibility issued by the Government of India. For NDA (1) 2019: The candidates possessing age between 2nd July 2000 to 1st July 2003 are eligible for the examination. If born before 2nd July 2000 and after 1st July 2003 then not eligible for NDA (1) 2019 exam. For NDA (2) 2019: Those who have age between 2nd January 2001 to 1st January 2004 are permitted to write the exam. If the candidate bears the age before 2nd January 2001 and after 1st January 2004, they are not allowed to appear the exam. Only unmarried male candidates are eligible for NDA examination. Girls are not allowed for the NDA entrance examination. Note-1: The DOB mentioned in the Matriculation/Higher Secondary Examination Certificate available or an equivalent certificate will be considered by the commission. Note-2: Candidates are informed not to marry until they complete their full training. A candidate who marries subsequent to the date of his application though successful at this or any subsequent exam will not be selected for training. A candidate who marries during the training shall be discharged and will be liable to refund all expenditure incurred on him by the Government. Note: Students who have debarred by the Ministry of Defence from holding any type of Commission in the Defence Services are not eligible to apply. Those candidates have failed INSB/PABT earlier are not eligible for Air Force. Candidates must be physically & mentally fit as per the physical standards maintained by the National Defence Academy and Naval Academy Examination 2019. Note-1: “Individual’s weight is considered normal if it is within ±10% departure from average given weight”. However, in individuals with heavy bones and broad build as well as individuals with a thin build but otherwise healthy this may be given some relaxation on merit. Note-2: Height relaxation is up to 2.5 cm. (5 cm. for Navy) may be allowed where the Medical Board certifies that the candidate is likely to grow and come up to the required standard on completion of his training. Candidates recommended by the Services Selection Board will go through a medical examination by Board of Service Medical Officers. Candidates who are declared fit by the Medical Board will be admitted to the academy. The candidate should be in good physical & mental health and free from any kind of disease/disability which is likely to interfere with the efficient performance of Military duties. There should be no symptoms of weak constitution, bodily defects or underweight. The Candidate should not be overweight or obese. Well developed chest. A fully expanded chest should not be less than 81cms. The minimum range of expansion after full inspiration should be 5 cms. Chest X-Ray is compulsory and will be taken to rule out any chest diseases. No maldevelopment or impairment of a function of the bones or joint. No past history of mental breakdown or fits. The hearing should be normal. A candidate should be able to hear a forced whisper with each ear at a distance of 610 cms. in aquiet room. There should be no evidence of present or past disease of the ear, nose and throat. Audiometric test will be done for AF. Audiometric hearing loss should not be greater than 20 db in frequencies between 250 and 8000 Hz. There is no impediment of speech. Blood Pressure should be normal with no signs of functional or organic disease of the heart and blood vessels. There should be no enlargement of liver or spleen. There will be not any evidence of disease of internal organs of the abdomen. Un-operated hernias will make a candidate unfit. In case of Hernia which has been operated, a minimum of 6 months must have passed prior to final medical examination before commencement of the course. No hydrocele, varicocele or piles. Urine examination will be done and any abnormality if detected will be a cause for disqualification. Any kind of skin diseases which is likely to cause disability or disfigurement will also be a cause for rejection. Candidates should have sufficient number of natural and sound teeth. A minimum of 14 dental points will be accepted. When 32 teeth are present, the total dental points are 22. A candidate should not be suffering from severe pyorrhoea. Arthritidies/spondylosis (Rheumatoid arthritis and allied disorders/ Ankylosing spondylitis/ Osteoarthrosis, spondylosis and degenerative joint disease/ Non articular rheumatism (e.g. lesions of the rotator cuff, tennis elbow, recurrent lumbago etc.) & Miscellaneous disorders including SLE, polymyositis, vasculitis. Unilateral/Bilateral cervical ribs with demon strable neurological or circulatory deficit. Mild Kyphosis or Lordosis where deformity is barely noticeable and there is no pain or restriction of movement will not preclude acceptance. In case of noticeable Scoliosis or suspicion of any other abnormality or spinal deformity, more than mild, appropriate X-rays of the spine are to be taken and the Examinee referred for specialist’s advice. The distance vision (corrected) should be 6/6 in better eye (6/9 in worse eye). Myopia should not be more than 2.5 D and hypermetropia not more than 3.5 D including Astigmatism. Internal examination of the eye will be done by means of opthalmoscope to rule out any disease of the eye. A candidate should have good binocular vision. The color vision standard will be (CP-III) for Army. Candidates wear the spectacles habitually then not eligible for AF. Hand held Stereoscope–All of BSV grades Convergence–Up to 10 cm Cover test for distant and near-Lateral divergence/convergence recovery rapid and complete Radial Keratotomy, Photo Refractive Keratotomy/laser in Situ, Keratomileusis (PRK/LASIK) surgeries for correction of refractive errors are not accepted for any Air Force duties. Candidates having undergone cataract surgery with or without IOL implants will also be not eligible to apply.Candidates must posses a good binocular vision (fusion and stereopsis with good amplitude and depth).Candidates who have undergone LASIK surgery are not declared fit for permanent commission in flying branch in IAF. In case of any doubt or query regarding NDA Eligibility Criteria 2019, you may ask us by commenting below. Sir so who can appear for this ?? You can check your eligibility for NDA 2016 from here. One thing i forget. I’m passed 12th commerce then i apply for INDIAN NAVY/ AIR FORCE only. you can apply for Indian Army only. Sir, I am currently in class 11th and my date of birth is 16th August 2000 ,am I eligible for participating in the NDA(II) Exam which will be going to held in September ? I have opted for PCM subject. not eligible. if pursuing 12th then OK.
my DOB is 31-12-1989 can i apply for NDA exam.? You can check eligibility requirements for NDA 2016 through this link. My dob is 19-06-1999. Can I apply for NDA (ll) exam of September 2016 ? Check your eligibility for NDA 2016 through this link. Diploma Holders Can Apply for NDA or not ? Then, you can join the Indian defense forces after your 12th. You are eligible for exam. I am 10 th appeared,my eye sight -2.25D ,please tell me can i eligible for air force, if not give me solution, suggest me other options. You can check your eligibility for NDA 2016 from this link. But why girls can not applied to appear in entrance examination? It is the decision of authorities. I’m 20yrs now did study in Science and I want to join Defence. I’m Schedule Caste. Can I join? It is not a big issue. The training is provided after selection. i am in class 10 but my dob is 2 october 2000 am i eligible ? I AM ELIGIBLE OR NOT ? I’m not eligible for this exam because I’m of Oct96. Right! Sir is there any chance in other NDA entrance exams that i m eligible for. You can apply when your age criteria will be satisfied. Is all this height weight etc. eligibilities are checked before examination or one have to maintain this before exam. After examination when you are selected, your eligibility will be checked. I am in class 11th up board and my DOB 15.1.2000 then I can able for NDA? No, you are not eligible for NDA (1) examination. Sir my DoB is 22-june-1997. I have taken all the subjects as required. I am giving my ISC board exam this March. So sir can I appear for the exams. You are not eligible as your age criteria doesn’t meets. You are not eligible for NDA (1) 2016.
my date of birth is 25 june 1999 am i eligible for nda? Are girls allowed to appear for entrance examination , if not why ? If her physical fitness is good , why she not been allowed to fill the form ? Girls are not eligible to apply for this exam. can i eligible for NDA exam? I’m born on 12 march 2000. The weights shown here are maximum weights or minimum weights for a candidate of a specified height? You can all the details about height and weight from the link of NDA 2016 eligibility. and i am in +2 can i apply for NDA? Can I apply for NDA?? still I am in FYME i. e First Year diploma in Mechanical Engineering. You should contact with the officials. You should be medically fit to apply for NDA. it has an option in registration like are you a creamy layer or not..? It means you belong to any reserved category or not. my birthday is on 09 September 1996. am I eligible for NDA EXAM.? I am appearing for May 2016 board exam for the IB (International Baccalaureate). My results will come in first week of August. Am I still eligble? Can i apply for nda air force…??? Can I apply for NDA after a laser operation to correct myopia?? I think yes but you can confirm it by contacting officials. You can check your eyesight eligibility of NDA 2016 from this link. if there is no possibilities.. can you please suggest me any other defence entrance examination 2016 to which i am eligible and also if one of the eligibility is 12th pass for the candidates whose d.o.b is 1995. i m doing my BE.ECE(ELECTRONIC AND COMMUNICATIONS) 3RD YEAR at present. You can fill CDS application form next year to join Indian Defense forces. I am a +2 science student and my date of birth is 18/12/1997 .now i am only have 18 years old .as i know i can apply for NDA-1 2016 .but in the case of NDA-2 ,is their any change in the eligibility date at the applying time . Those who have age between 2nd January 1998 to 1st July 2001 are permitted to write the NDA 2 exam. I got a message from sarvgyan for applying the form of nda. My dob is 23rd april 1997. Can I apply? That is a intimated message that the forms has been announced. i’m in 11 now and after 1 month i will be in 12 and i also have ST caste certificate . can i apply for NDA1 and NDA 2?? The pattern is not correct like why girls can’t apply for NDA? There are many girls outside like me who are eager to go in Navy n Army.. Girls can join Dfences forces through CDS, or Technical entry exams. Yes, the salary will be paid to the qualified candidates after joining. To join Indian defense force through NDA, you have to fill the NDA 2016 application form and for that fee will be Rs 100/- for gen candidates. No fee for SC/ST or son of army person. What is eligibility of subjects for applying NDA ? The NDA 2016 eligibility is mentioned in this link. is there any relaxation for eligibility on the basis of height and weight ? cuz i am 175 cm tall but i am 73 kgs in weight will they allow me ? I think there is no relaxation with respect to height and weight. You can confirm it from the official website. my height is 175 cm and my weight is 72 kgs. i am not obese or having body fat. yes he can apply, but check ur age. I can apply for !!! can I apply for this ??? You can only apply for Indian army through NDA. Yes, girls cannot apply for NDA but the female candidates can join Indian defence forces through CDA exam. Yes u can but only for Indian army. yes u can..but only for Indian army not for naval and airforce..
how can girls apply for NDA then? Girls candidates cannot participate in this exam. WHY CANT A GIRL APPLY FOR NDA? It is a decision of authorities. I am in 1st year.me passed hs on 2016 from arts stream. Can i give nda exam 2017? 24 Jan 1997 am I eligible? 17 oct 1998 am I eligible?? yu can’t between 2nd July, 1998 to 1st July, 2001 are eligible for the examination. If born before 2nd July, 1998 and after 1st July, 2001 then not eligible for NDA (1) 2017 exam. im worried about is this would prohibit me to get selected in medical test..? Nope,,,, between 2nd July, 1998 to 1st July, 2001 are eligible for the examination. If born before 2nd July, 1998 and after 1st July, 2001 then not eligible for NDA (1) 2017 exam.